Note – I wrote this one early on in the trip whilst still in India, and it’s quite long. It’s unlikely that future days will be this long! Click on the link if you want to understand the Elephant Wanderings part of the title. The flight from Heathrow to Delhi went just like many international flights do. The quirks of this particular flight included: H had a video screen who’s touchscreen settings were about an inch left of those shown on screen, and in-arm remote that didn’t work. It’s a good thing she wasn’t bothered about using it much! I managed to watch the very cheesy promotional videos for a few Indian towns, where absolutely everything about them, if the videos are to be believed, is magical, colourful, mystical, enchanting and just generally amazing. In all honesty they didn’t really tell me anything, but whiled away a couple of hours being amused by the language used. I managed to nap, on and off for much of the night after this, before accepting that no more sleep was forthcoming, and watched the Maleficent movie available – not too bad a film, but a little heavy for a Disney movie? 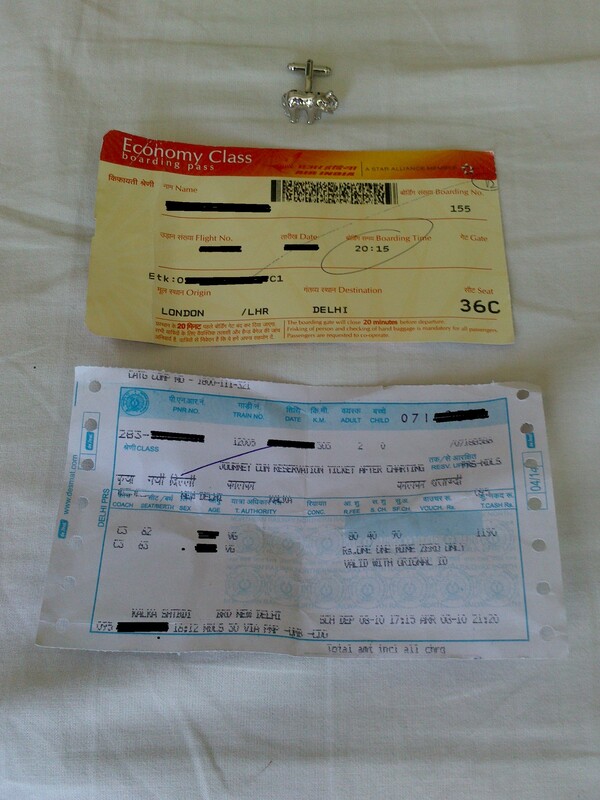 Upon arrival in Delhi, after my customs official finally accepted I didn’t have a hotel, and was headed to Shimla (for some reason Kalka seemed an unknown entity), wrote on my arrivals form “local hotel Shimla” and waved me through with and air of exasperation. Our plan to take the metro into town was a good one, 100 rupees for an eerily quiet and very clean station and efficient train meant a smooth arrival into Delhi. And then the fun began. You see we’d both read the section in the guidebook that mentioned that the tourist ticket booth was on the 1st floor of New Delhi station, and that touts would try and convince us otherwise. So we confidently walked across the road from the metro to the station building visible opposite, happily ignoring the taxi touts and anyone else attempting to get in our way. It was the x-ray machines and barriers before the staircases that threw us, caused us to hesitate and obviously marked us out as vulnerable tourists. A gentleman, in a friendly manner asked if we needed help, and subsequently told us we needed a ticket to pass, and that tourist tickets can be bought in town. Not wanting to cause a scene and appear rude (how very British of us), we scurried away (though not to town). Between us, we realised these chaps were not ‘officials’ and tickets were not actually being asked for. So after a bit of “check yourselves girls” type chat, we strolled on through and found the tourist ticket office at the other end of the station, i.e. over the other side of a plethora of train tracks, visibly signposted on this side with warnings about touts above their heads. It was at this point we both realised something – that we’d both been very silly. Neither of us had bought the travellers cheques or US Dollars at Heathrow as we planned! So we had 10,000 Rupees each that we had been limited to drawing out at the Delhi airport ATM’s, about 20 pounds sterling, and a Aus$100 note that my work colleagues had given me as a leaving gift. This was not going to buy us the 90 day rail pass we had planned! So whilst I got a little peeved at the stupidity of this situation we had put ourselves in, H came up with the idea of finding an internet café to locate a reputable money exchange office. You see, the actions of the touts and supposed ‘guards’ and officials in the area, by this time (yes I have missed out some things here, you don’t need that much detail) had led me to a complete feeling of distrust, so we couldn’t just get in a taxi or rickshaw and ask them to take us to one. This feeling of trust did not help my frame of mind (see my blogging debate post for more on that). Anyway, money obtained, and back to the ticket office, we eventually after much paper pushing had tickets for today, tomorrow, and the 90 day pass to start after our retreat. And with half an hour to spare, we got some drinks before getting on the Express (Shatabdi) train to Kalka. Whilst I turned into a nodding dog, H chatted to her neighbour who apparently was not overly happy (in a considerate way) about us having no booked hotel. Whilst she patiently listened to his advice and reviewed his mobile app findings, once he left the train we agreed we would stick to Plan A – wander into town until we found a hotel we liked the look of, or recognised a name from the guide book (which was back at Lincoln library). Thankfully, Kalka is small. Getting off the train, there was very little tout/taxi offers, and we were free to wander up what looked like the one road (what with it the being the only light source around) of town. Spotting what looked like an ok hotel, we dutifully asked to check the room before we agreed on a price and I completed the relevant paper forms. I fully accept that every place we stay will ask us to complete and sign a large journal about who we are, where we’ve come from, where we’re going to and have a photocopy of my passport and visa taken. No identity security concerns here then! Someone, if they wanted to, could literally track us across India. Though it would take a VERY long time – what with everything being in what I can only describe as A3 size paper accounting ledgers. So whilst trying/difficult, I’m classing our first day as a win. We’ve arrived, not been scammed, booked trains and obtained rail passes, travelled a fair distance and found a suitable hotel!